I’m a little behind schedule here since I’m just now telling you about Christmas cookies, but better late than never. I was out of town for a birthday party right before Christmas, then Christmas happened, and so this post didn’t find itself ready until today. Swirl-shaped cookies became my theme for this year. As I started looking through files of cookie recipes and books full of cookies, I remembered a cookie I hadn’t baked for years that was kind of like a cinnamon roll in cookie form. With that shape in mind, I pulled every rolled up, spiral cookie option I found. This chocolate almond number was from the December 2004 issue of Living magazine. The recipe isn’t available online, so I’ll include it below. You do have to make two types of dough and roll them both out, there is some waiting while dough chills here and there, but layering the dough and forming the spiral is easier than you might think. The lighter, almond dough is made with ground, toasted, blanched almonds and almond paste, and it smells so lovely as it’s mixed you know it’s going to make an excellent cookie rolled up with chocolate dough. This was one of those treasures from the files that makes me happy I’m such a pack rat about keeping all those old recipes. I set about making the almond dough first, but both need to be made and chilled before proceeding. For the almond dough, blanched almonds were toasted and allowed to cool. In a food processor, sugar, almond paste, flour, and salt were pulsed. The toasted nuts were added, and the mixture was processed until finely ground. Last, butter, eggs, and vanilla were added and pulsed to combine. The dough was wrapped in plastic and chilled overnight. For the chocolate dough, butter and sugar were creamed in a stand mixer. Eggs were added followed by milk, flour, and cocoa powder. The finished dough was wrapped in plastic and chilled overnight as well. Once both doughs are chilled, they needed to be rolled out on parchment paper. You should start with the chocolate dough and roll it to fit on the back side of your largest baking sheet that will fit in your refrigerator. Just slide the parchment onto the back of the baking sheet after the dough is rolled, and then refrigerate it while rolling the almond dough. The almond dough should also be rolled on a sheet of parchment to just slightly smaller than the chocolate dough. Next, the chocolate dough should be placed on your work surface and brushed with egg white, and the almond dough is transferred to the top of the chocolate. I didn’t have great luck with this. The almond dough fell apart as I tried to place it on top. The good news is that it doesn’t matter. You can move the almond dough around in pieces and fill any blank areas as needed. Then, sprinkle the almond dough with flour and roll the layered doughs together into a larger rectangle about 11 x 24 inches or so. Starting on a short side, the layers are then rolled into a spiral, and egg white is brushed on to seal. The rolled dough should be chilled in the freezer before slicing and baking. The swirl shape makes a festive cookie and combines two great flavors in every bite. It’s also handy to be able to slice and bake a few cookies at a time if you’d like since the dough can remain in the freezer. 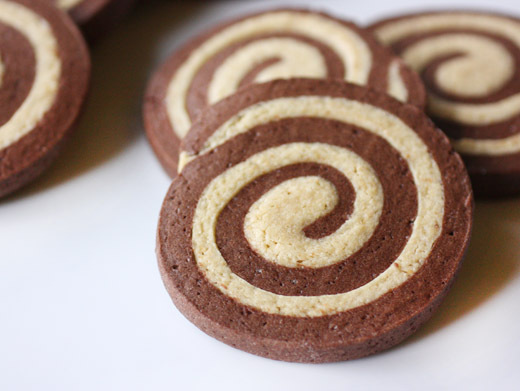 I liked this spiral-shaped cookie theme, and now I’ll be looking for more cookies like this. I hope you’re all having a great holiday season, and Happy New Year to you all! -Preheat oven to 350 degrees F. Toast blanched almonds until just browned, about 13-15 minutes. Shake pan from time to time during toasting to turn the nuts. Allow nuts to cool. -In a food processor, pulse sugar, almond paste, flour, and salt until very fine. Add toasted almonds and process until finely ground. Add butter, eggs, and vanilla and pulse until combined. Wrap almond dough in a plastic and refrigerate for at least an hour or up to a day. -To make the chocolate dough, sift together the flour, cocoa powder, and salt and set aside. Cream butter and sugar in a stand mixer with the paddle attachment or with a hand mixer. Mix until fluffy, about 2-3 minutes. Add eggs and mix to combine, and then add the vanilla and milk and incorporate. With the mixer on low speed, slowly add the flour mixture and mix to combine. Wrap the dough in plastic and refrigerate for at least an hour and up to a day. -Cut a piece of parchment paper large enough to cover the back side of a baking sheet. Place the parchment on a work surface and sprinkle with flour. Place the chilled chocolate dough on the floured parchment. Dust the dough with flour, dust a rolling pin with flour, and roll the chocolate dough to a large rectangle to just fit on the back of a baking sheet. Slide the parchment paper with dough onto the back of the baking sheet and refrigerate while rolling the almond dough. -Repeat the process of cutting a large piece of parchment paper and sprinkling it with flour. Place the almond dough on the floured parchment and dust the dough with flour. The almond dough is particularly sticky, so add flour as needed while rolling it into a large rectangle. The almond dough rectangle should be a couple of inches smaller than the chocolate dough rectangle. Remove the chocolate dough from the refrigerator and brush the top of it with egg white. Turn the almond dough onto the chocolate and remove the parchment from the almond dough. If the almond dough breaks during transfer, it’s not a problem. The dough can moved into place in pieces and patched as needed. Then, sprinkle the almond dough with flour and roll the two layers together into a larger rectangle about 11 x 24 inches or so. If you’d like a neater starting edge, trim a short side of the dough where you will start rolling. 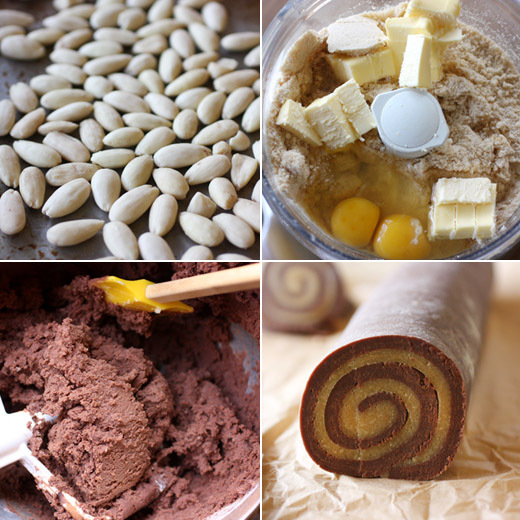 -Begin rolling the dough from a short side and continue to form a dough log. Brush more egg white on the chocolate dough to seal the closing edge. Wrap the rolled dough in parchment paper and chill in the freezer for about an hour and a half before baking. -Preheat oven to 350 degrees F. Line baking sheets with parchment or silpats. Using a serrated knife, slice the rolled dough into 1/4 inch rounds. Rotate the dough after each cut to keep an even shape. Transfer cookie slices to baking sheets and bake until just set, about 18-20 minutes. Cool on racks and devour unless you plan to share with Santa. When I was a kid I could never figure out how cookies and cakes got 'swirly'. I really thought it was magic! Now that I know the secret, the magic is still there. These cookies look beautiful and I love the almond flavor there. Awesome combo! So pretty, and I love the combination of chocolate and almond. Pinning to use next year! Chocolate and almond is a perfect match! Cookies are always welcome! Swirl cookies are always attractive, and almond and chocolate pair together so well. These look terrific! Thanks, and Happy New Year. They look very pretty! And I enjoy a simple combo (chocolate and almond) cookie anytime! I love it! I love two flavor cookies, especially presented this way. As soon as I get over my laziness about blanching the almonds I have, I will definitely come back to this recipe. That looked so lovely even raw in the roll. The finished result is quite spectacular. I hope that 2013 is rich in experiences, filled with love and happiness and great food just like this Lisa. Have a safe and happy New Year. Smile often and those around you will too. I made some chocolate swirls last week, but with coconut filling....I will love these almond filling too. I love that you chose a theme for your cookies. What a great idea! these look fabulous. I love the idea of the chocolate/almond flavor combo. I hope you had a great Christmas and a blast in Vegas! Looking forward to more of this spiral theme- these cookies look and sound terrific. Happy New year! Whoa, these are PERFECT! 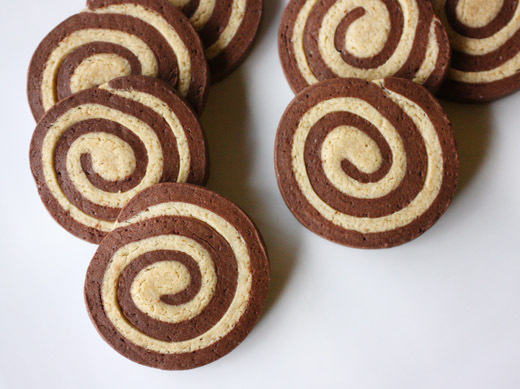 I've been tempted to make swirl cookies, but afraid mine would not look anything like yours. I'm very impressed!!!! Brava! I love these not too sweet cookies, and so pretty too. Thanks for reminding me how good they are. These cookies are beautiful. Nothing I bake looks this professional. Great recipe. These cookies sound like they would be good for any time of year. Happy New Year! Love the swirl cookies, Lisa. I've made something similar and the best thing is freezing the dough for use later. When we were kids my mother used to bake swirl cookies for Christmas and I was always fascinated by them. I wish you a Happy and Healthy New Year Lisa. it's never too late for cookies! Especially when chocolate and almond are included! I would agree it best to hide a few for Santa's cookie plate. After all, That's one guy we should should keep happy with cookies! I love pinwheel cookies and I honestly can say these are the most beautiful, perfect ones I have seen anywhere!